In case you missed it: Lidar is Magic: Part 1 , in which we learned that LIDAR is pretty great, but just one in a suite of tools used by archaeologists. And also, there are no lost cities. Lidar image of Pre-Angkorian towers of Sambor Prei Kuk among the trees. Courtesy McElhanney via the Cambodian Archaeological Lidar Initiative (CALI). I’ve had several people contact me with an interest in doing archaeological research in Cambodia and questions about becoming an archaeologist. Although I’ve discussed this a bit in this post, I realized that not a lot of people know what it’s like to be an archaeologist. So, I thought I’d take some time to detail my experiences and explain what it is I actually do. Your regularly scheduled news and insights into Cambodian archaeology will return after this post. What do we know about Angkorian society? Things have been busy these past few months with lots of developments and exciting new changes to come. 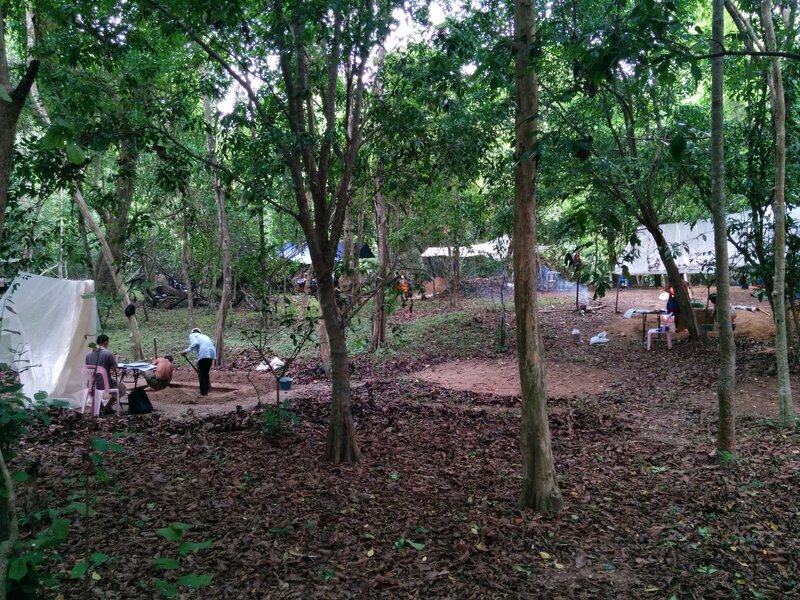 Since June I’ve been directing an excavation project looking at a house mound within the Angkor Wat enclosure. This project is part of the Greater Angkor Project research program, a collaboration between the APSARA Authority and the University of Sydney. I’ll follow-up with a longer post on this work later, but in the meantime you can read a short article on this work in The Phnom Penh Post here. I have also been tweeting regular updates on the excavation and you can follow along at @alisonincambo. The Phnom Penh Post article describes this project as one of the first to focus on the common people and in a way, this is true. This is the first research-driven project focused on excavating a house mound and understanding the lives of the people who lived there (non-elite members of society) through the material remains of activities within and around a house. This is a branch of archaeology known as household archaeology. However, there have been several research projects recently that have expanded our understanding of Angkorian habitation and Angkorian society more generally. A photo of our excavation trenches within the Angkor Wat enclosure. My Facebook feed was atwitter yesterday with news that Beyonce and Jay-Z had visited Angkor. I was also pleased to see that my friend, Kompheak Seng was the one to show them around. Kompheak is an accomplished archaeologist who has undergone training at the University of Hawaii and worked in Cambodia and the Philippines. 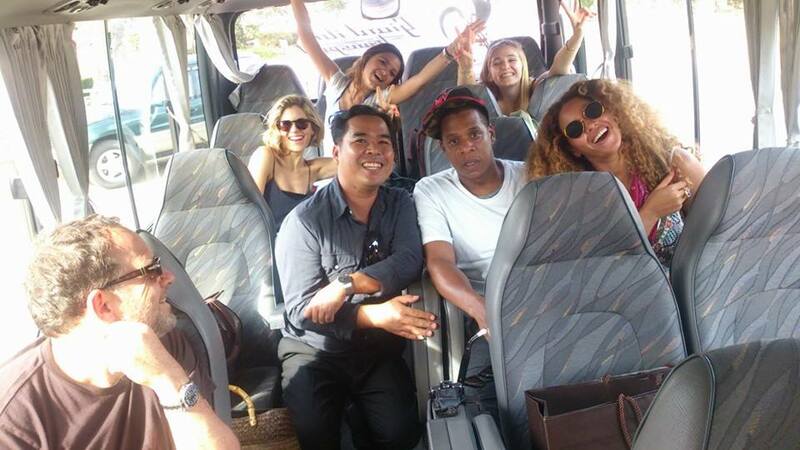 Kompheak Seng (sitting to the left of Jay-Z and Beyonce). Photo courtesy of Kompheak Seng. He told me that he took them to Angkor Wat and the Bayon. (I guess they didn’t have time to see more). He said they were excited to see the smiling faces at the Bayon. Unfortunately, they didn’t have time to pick Kompheak’s brain about Cambodian history and archaeology nor did he get a chance to show them Cambodian delicacies like prahok. Maybe on their next trip! Curmudgeon month continues here as I take another myth about Angkor to task. 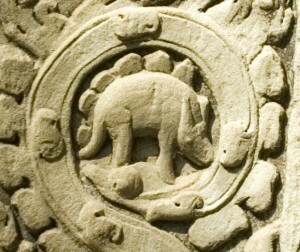 This time it’s the silly “Stegosaurus at Ta Prohm” rumor. This myth has been popularized by young earth creationists*, who’ve argued that one particular small carving on a doorway at Ta Prohm depicts a Stegosaurus. Never mind that the entire temple is covered with carvings of fantastic and mythical creatures, this one carving is evidence that humans and dinosaurs co-existed. Carving on Ta Prohm. This is not a stegosaurus. I suppose I’m a bit of a curmudgeon and therefore get fairly easily annoyed. 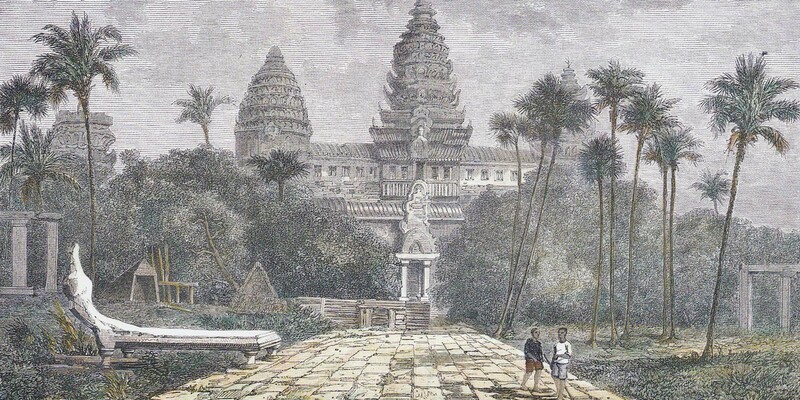 One of my biggest pet peeves is the old myth about how the French, specifically the explorer and researcher Henri Mouhot, “discovered Angkor” in 1860. This myth is based on an idea that the Cambodians had no knowledge of their past, and therefore helped the French justify their colonial rule in “restoring a nation to its past grandeur” (Dagens 1995:47). As Angkor has been in the news lately, due to the recent BBC documentary, this factual inaccuracy continues to be perpetuated. It’s time for this myth to die. A drawing of Angkor Wat by Henri Mouhot, who did not discover Angkor. The issue is available in well-stocked bookstores. However, an easier option may be to download the Kindle version via Amazon.